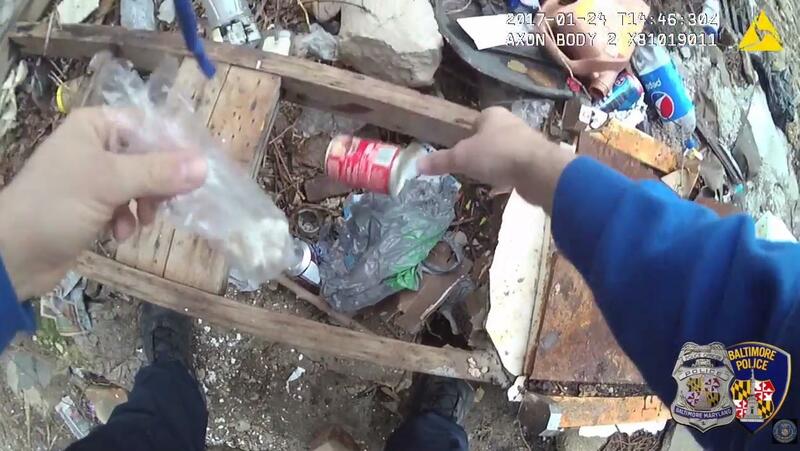 Approximately 123 cases are under review after body camera footage appeared to show an officer planting illicit drugs at a crime scene in January, said Marilyn Mosby, Baltimore's state's attorney. Mosby said her office has dismissed or will dismiss cases that soley relied on the officers' credibility. "Where these officers are material and necessary witnesses, we are dismissing those cases, which rely exclusively on the credibility of these officers," she said. "As I have stated before, it is incumbent upon us as prosecutors to be the ministers of justice and to do what's right in the pursuit of justice, over convictions, while simultaneously prioritizing public safety," she said. Chief Counsel Antonio Gioia said the cases dropped were felony drug and free-standing firearms cases. Following the discovery of the 90 second video, one officer was suspended, and two others were placed on desk duty while the Office of Professional Responsibility completes its investigation. At a news conference Wednesday, Baltimore Police Department Commissioner Kevin Davis said he wasn't concerned that the video could jeopardize other cases. "This is a serious allegation of police misconduct," Davis said. "There's nothing that deteriorates the trust of any community more than thinking for more than one second that uniformed police officers -- and police officers in general -- would plant evidence of crimes on citizens." Eric Rich, whose son was arrested by one of the officers, told CBS Baltimore that his son spent several months in jail before Maryland prosecutors dismissed the charges. "There are a lot of cases and you have a lot of innocent people who got locked up," he said. "So what is the state going do about this? Is they going to reward the people that they got locked up for nothing?"